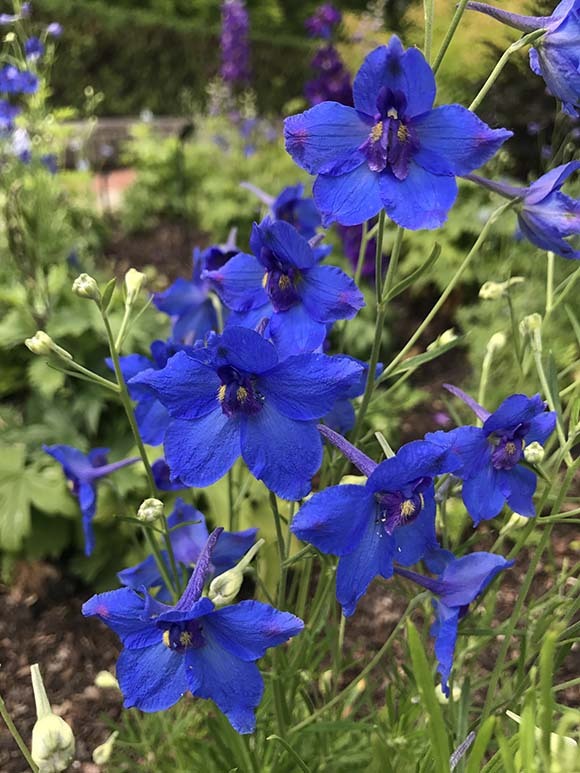 Jacob works as the curator of herbaceous perennial plants at the Chicago Botanic Garden, where perennials, bulbs, herbaceous vines, and ground covers make up the most extensive part of the Garden's collection. 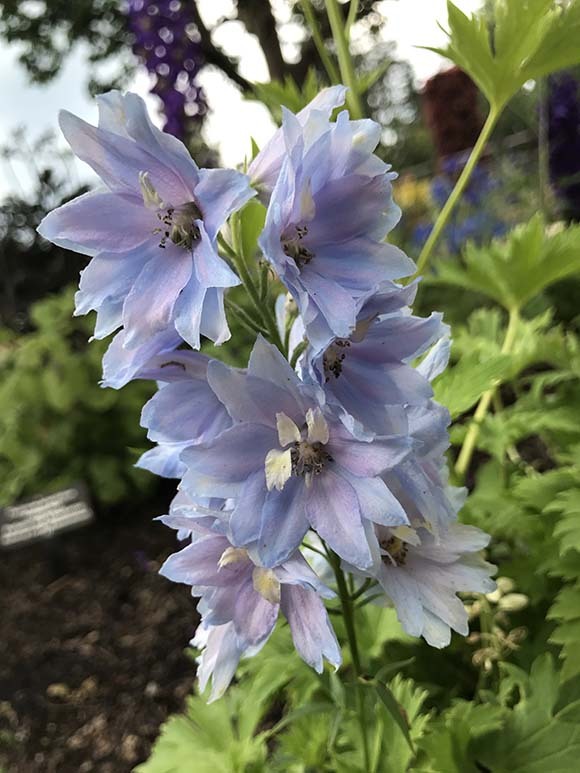 His responsibilities entail increasing the size and diversity of the collection, conducting collections-based research, and sharing information about herbaceous perennials with the public and professionals alike. 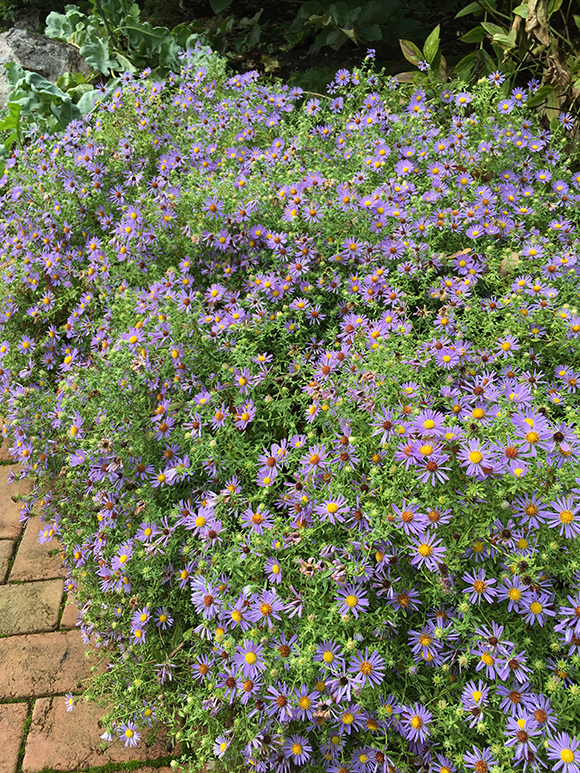 The harbinger of fall, for many folks, is when asters finally bloom. 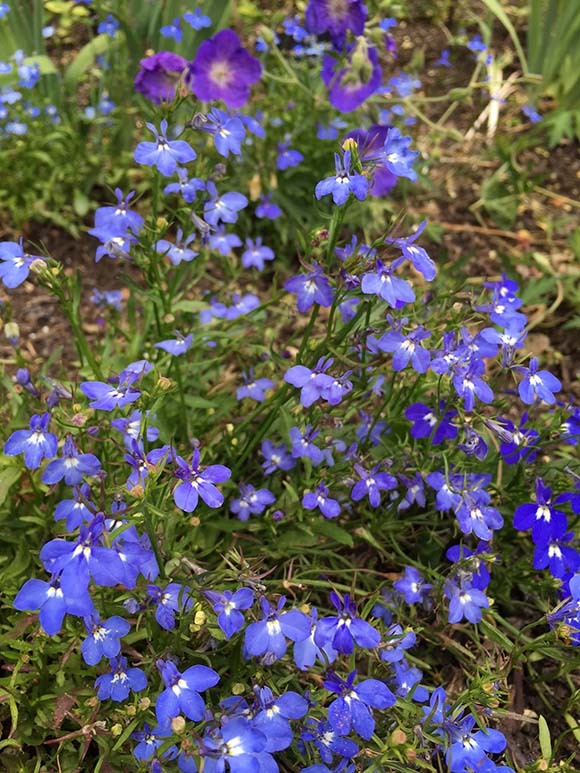 Their flowers look like miniature daisies and come in shades of purple, blue, white, and occasionally pink. These cool tones allow autumnal hues of yellow, orange, and red to truly pop throughout the landscape. 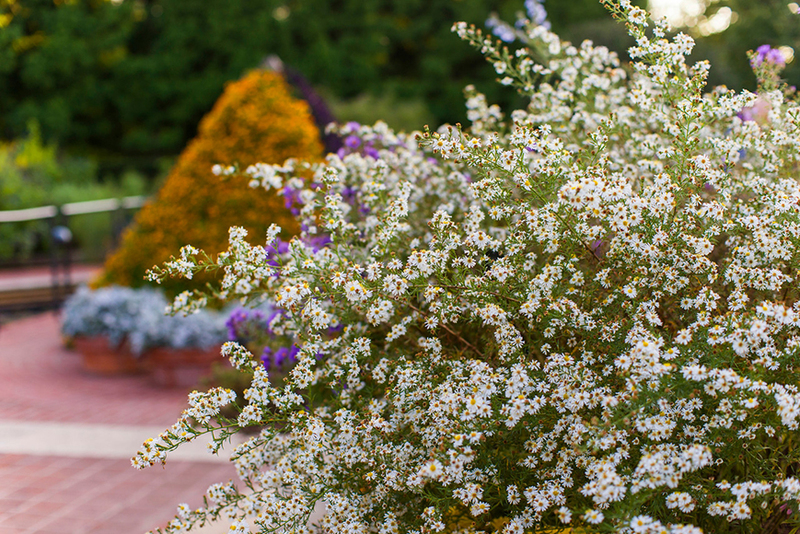 Aster blossoms twinkle across roadsides, meadows, woodland edges, and even home gardens. Interestingly, astéri is the Greek word for star. 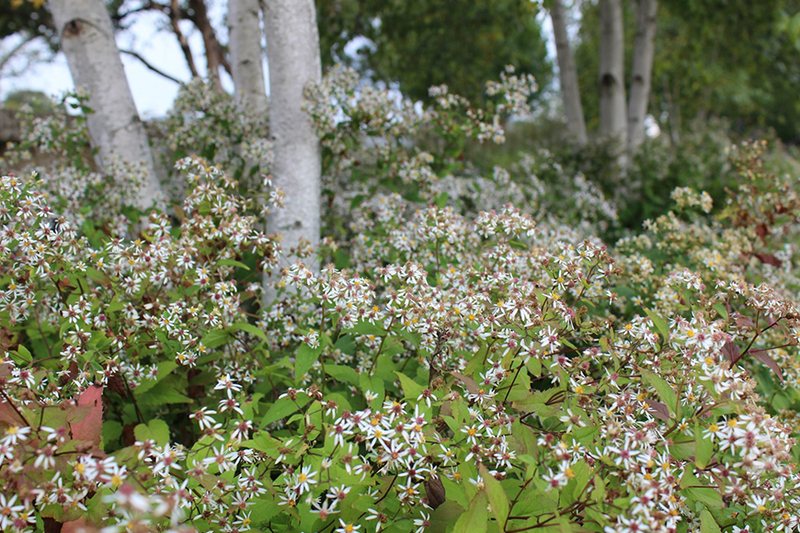 White wood aster among birch trunks near the Bernice E. Lavin Plant Evaluation Garden sets the perfect fall scene. Hosts of pollinators favor asters. The late-season blooms provide vital sustenance for adult monarch butterflies during their annual migration to Mexico. 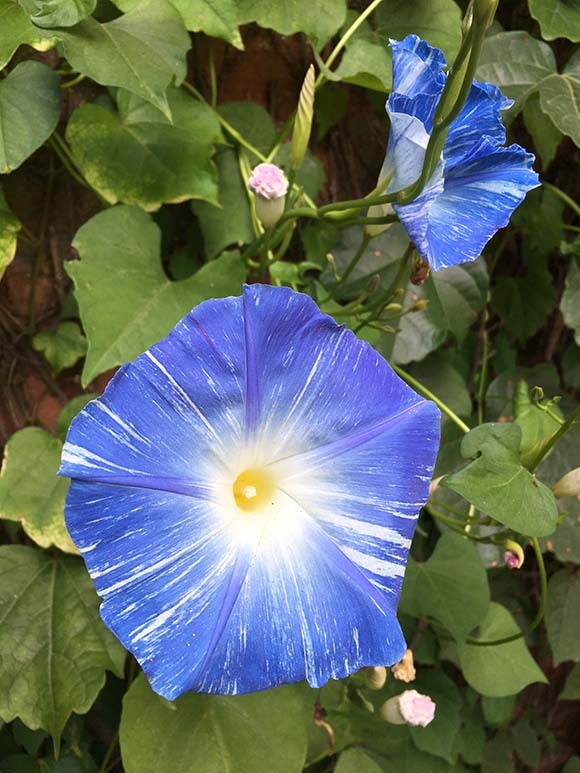 Each flower contains plentiful sources of pollen and nectar, because the central disc is comprised of up to 300 tiny florets. After pollination, a disc will turn darker and reddish, informing other insects to keep moving. In the end, birds come to consume the seeds. Asters belong to a huge family called Asteraceae, which also includes daisies, black-eyed Susans, and sunflowers. They are mainly native to North America and Eurasia. More than 600 species once made up the genus known as Aster. 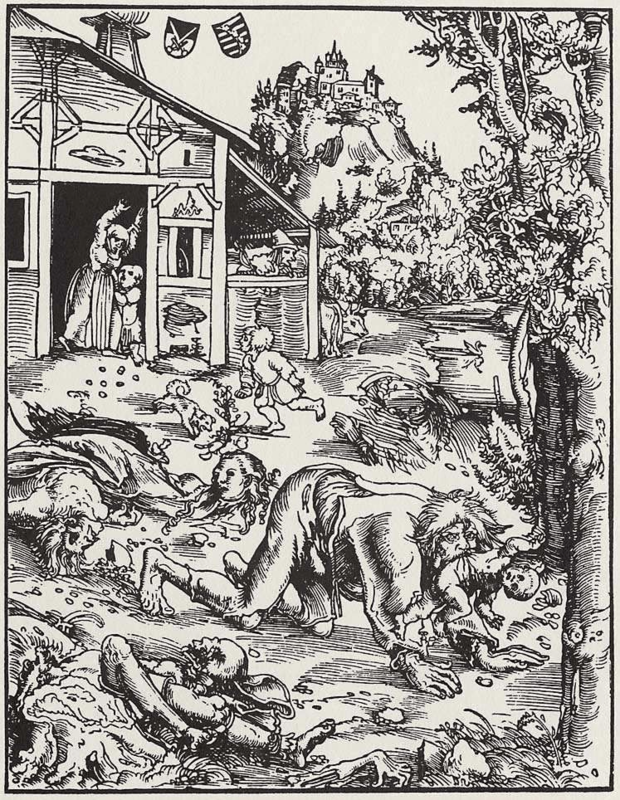 However, in the 1990s, taxonomists decided to divide New World species into ten other genera. The most common ones are Eurybia and Symphyotrichum. 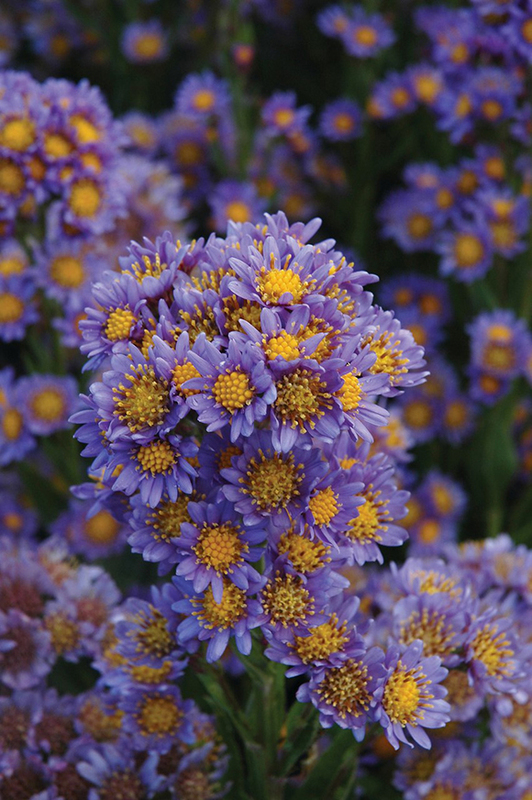 Few nurseries adopt these names and continue to list their plants under the genus Aster. Jindai Tatarian aster (Aster tataricus ‘Jindai’) can be found in the Lakeside Garden and on Evening Island at the Trellis Bridge. White wood aster (Eurybia divaricata) can be found in the Heritage Garden beds, throughout the Landscape and Bulb Gardens, in large groupings on Evening Island, and all around the Plant Science Center. Jindai Tatarian aster (Aster tataricus ‘Jindai’) originates in Asia and has uniquely large and toothed foliage. From mid- to late fall, lavender-blue daisies appear in showy flat-topped clusters upon 3 – 4 foot tall stems. 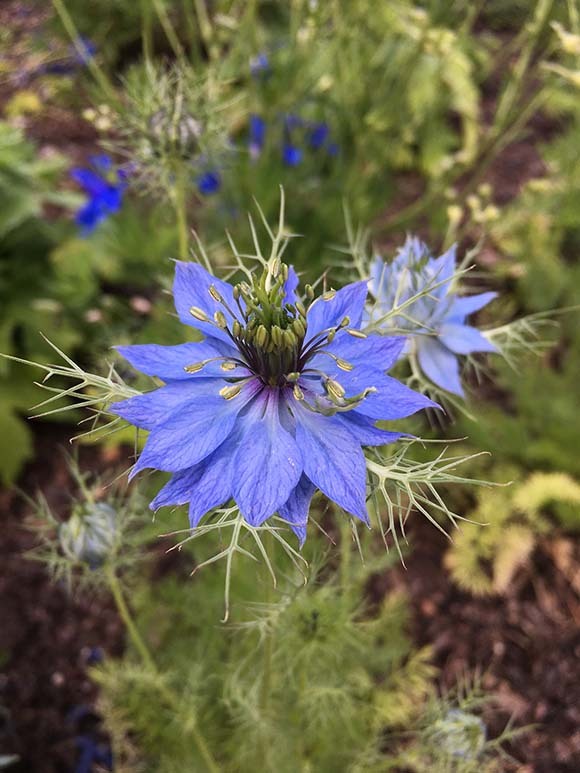 Best planted in the back of a bed with plenty of sun and space, its roots slowly spread into a weed smothering ground cover. Pair it with some equally tall and tough switchgrass (Panicum virgatum). 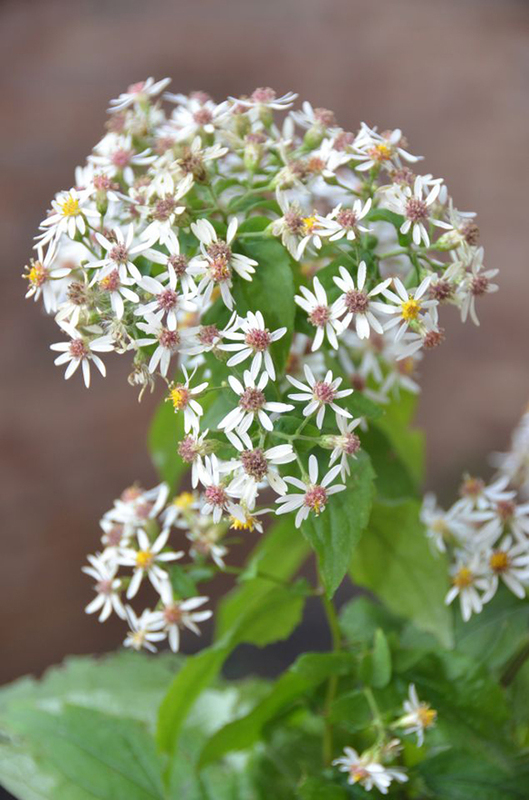 White wood aster (Eurybia divaricata) blooms for a long time, starting in late summer and lasting throughout fall. 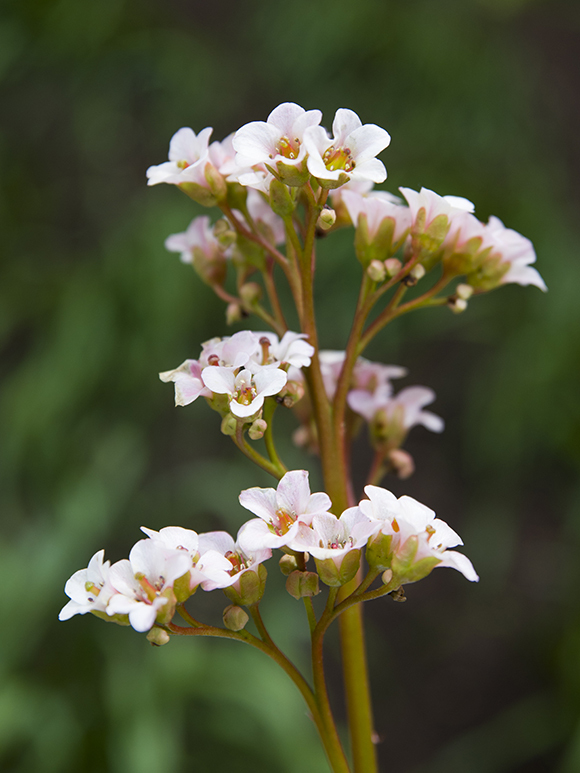 Clouds of starry white flowers are borne on 2-foot stems with heart-shaped leaves. It grows in woodlands of eastern North America where it spreads slowly by rhizomes and quickly from seed. Cut spent flower stems off if you do not want extra plants. Combines wonderfully with ferns, sedges, and shade-loving goldenrods like Solidago caesia or Solidago flexicaulis. Avondale blue wood aster (Symphyotrichum cordifolium ‘Avondale’) can be found on Evening Island, just west of the carillon along the path. Find aromatic aster (Symphyotrichum oblongifolium ‘October Skies’) in the Landscape Garden, along the Lakeside Garden path, at McGinley Pavilion, on Evening Island near the Arch Bridge, and near the Plant Science Center. Avondale blue wood aster (Symphyotrichum cordifolium ‘Avondale’) is an extra-floriferous selection of an eastern North American species found at forest edges. 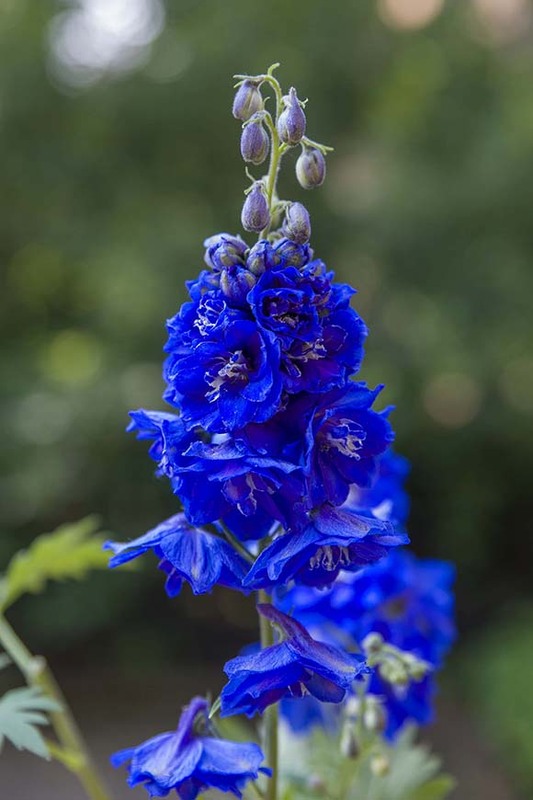 A plethora of attractive blue flowers begin in early fall on 2 – 3 foot stems. 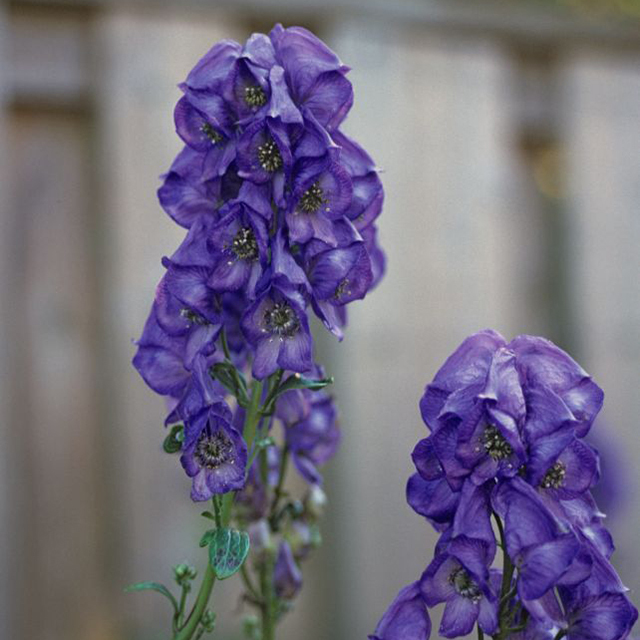 Grows well in either sun or shade, where it adds additional color to perennials like Japanese anemone (Anemone hupehensis), monkshood (Aconitum), and the yellow fall foliage of blue star (Amsonia hubrichtii). October Skies aromatic aster (Symphyotrichum oblongifolium ‘October Skies’) is a great alternative to New England aster (S. novae-angliae), because it is less prone to powdery mildew. With full sun, it forms a compact 2- x 2-foot mound of nicely scented foliage. 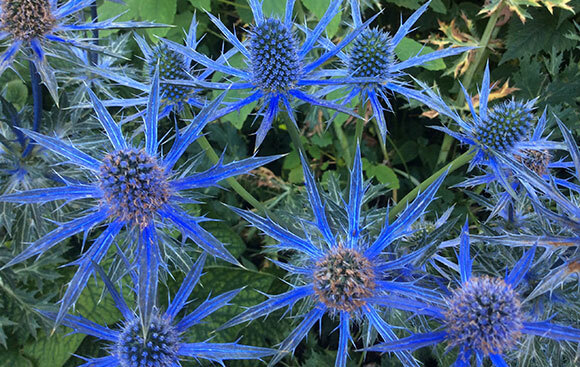 In autumn, hundreds of blue-purple flowers cover the plant. The species naturally occurs across the central and eastern United States. Try it with fountain grass (Pennisetum alopecuroides). Frost aster (Symphyotrichum pilosum) overflows the center plantings of the Heritage Garden. 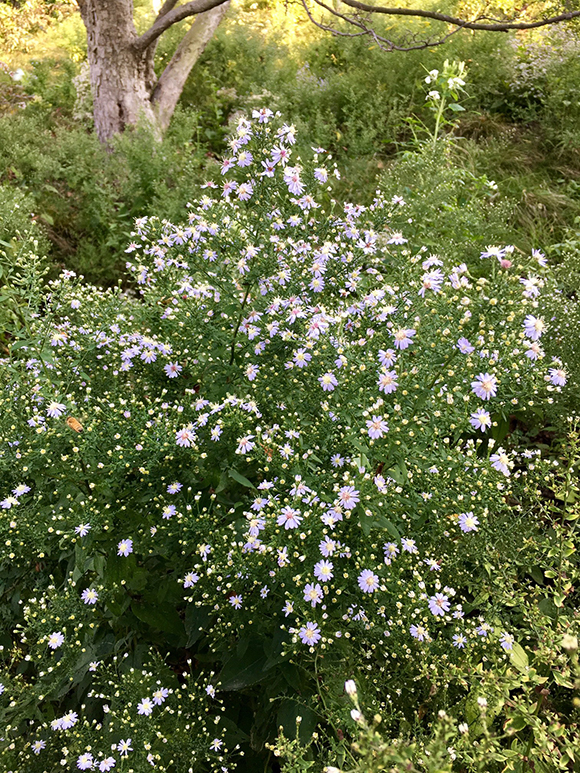 Frost aster, or hairy aster (Symphyotrichum pilosum) is a 3- x 3-foot, clump-forming plant with many branched and arching stems. In fall, it becomes loaded with little white daisies and creates a baby’s breath appearance among flowers like Japanese anemone (Anemone hupehensis). Frost aster is common in a variety of dry, sunny habitats in eastern North America. 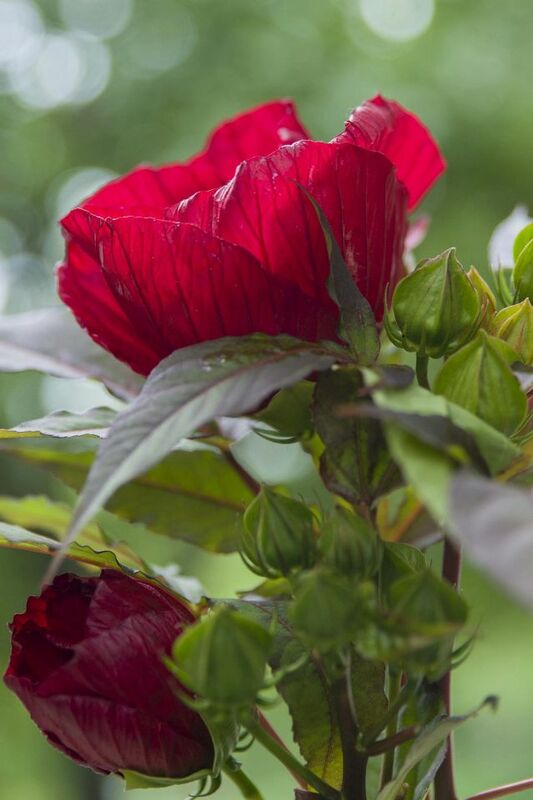 It spreads happily by seed, so if you have too many, cut off the spent flower stems before they develop any further. Most perennials are deciduous. They go dormant when their above-ground parts die in the fall and then they rely on the energy and nutrient reserves stored in underground roots during the winter. 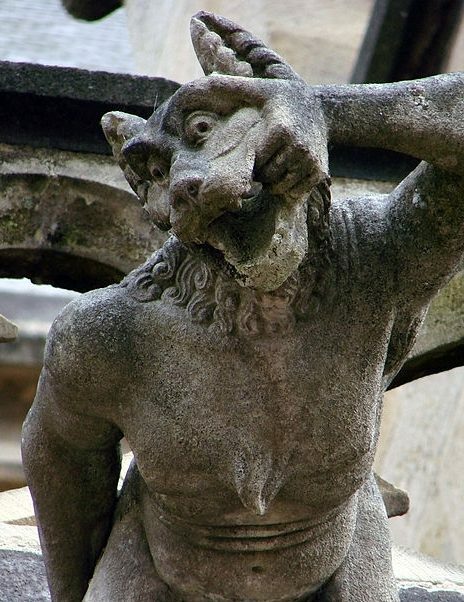 But without a pretty blanket of snow all season, a garden can look drab and dead. 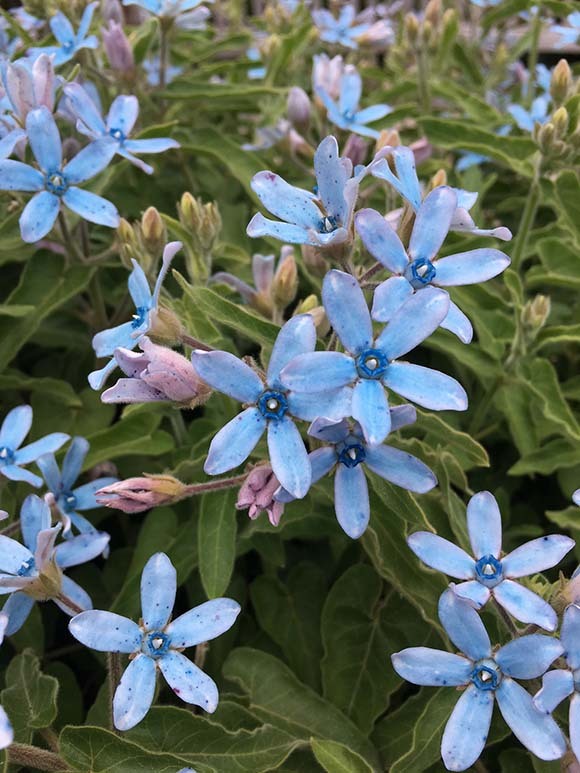 Fortunately, there are some perennials with attractive and durable evergreen foliage that last the winter months, even in Chicago. Why do they stay green so long? Well, evergreen leaves contain lignin, the same polymer in the cell walls of woody plants, throughout the veins and surrounding tissues. This makes them waxy, durable, and less prone to wilt or tear. 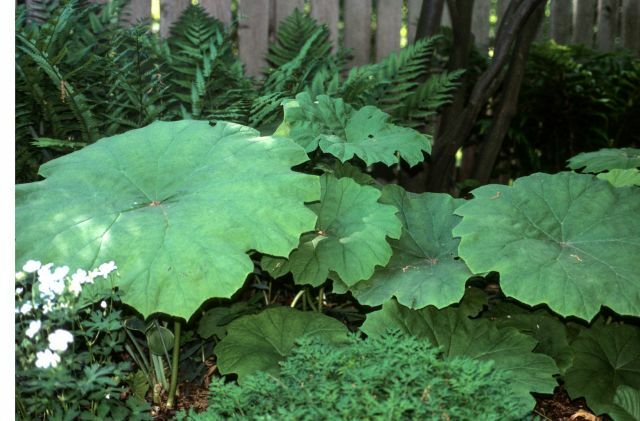 These leaves are also less likely to get diseases or be browsed by critters. But the main reason for a perennial to have evergreen leaves is to provide a place to store energy and nutrients while they are dormant. 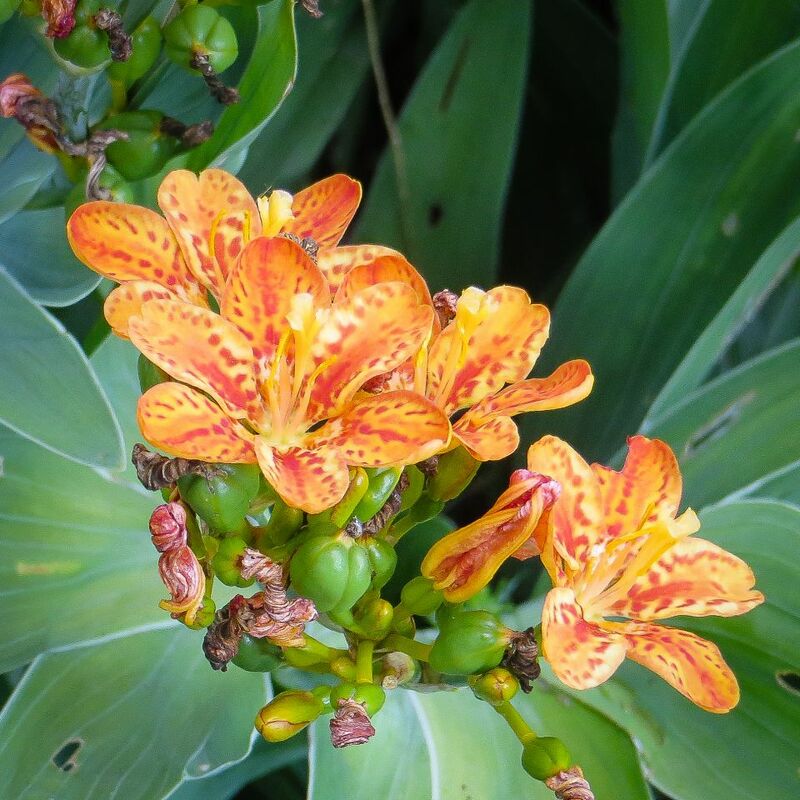 Evergreen perennials are quite trouble free but having modified leaves comes with a price. They are vulnerable to winter burn, a situation where the leaves become dehydrated, leading to injury or death. This can occur in late February or March, when sunlight is directly hitting the plant and the soil is still frozen. The sunlight heats up the leaves and causes them to transpire (lose water), yet the roots remain frozen and unable to replace what was lost. 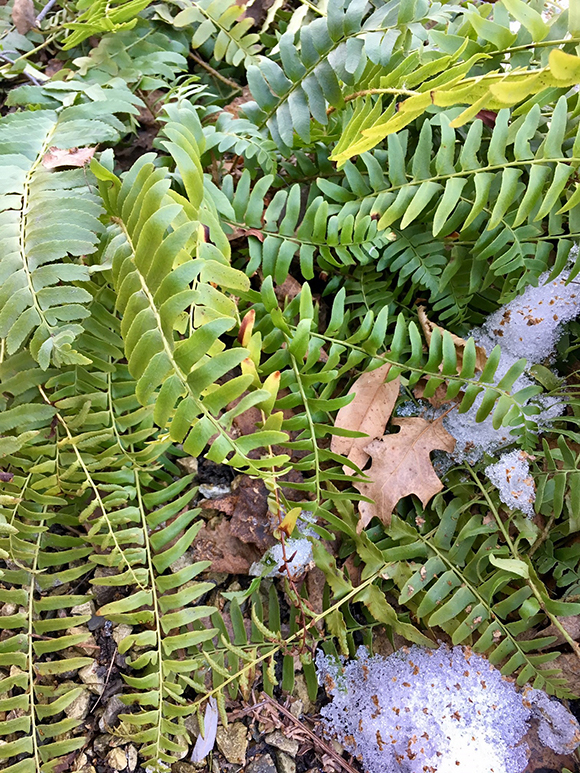 Fortunately, snow cover protects evergreen perennials by shading them and insulating the ground. Also, planting them on the north or east side of a structure will provide ample shade in late winter because the sun is lower. The energy and nutrient reserves in evergreen leaves are utilized by new growth in spring. This is why most evergreen perennials do not shed their original leaves until the fresh leaves are complete. 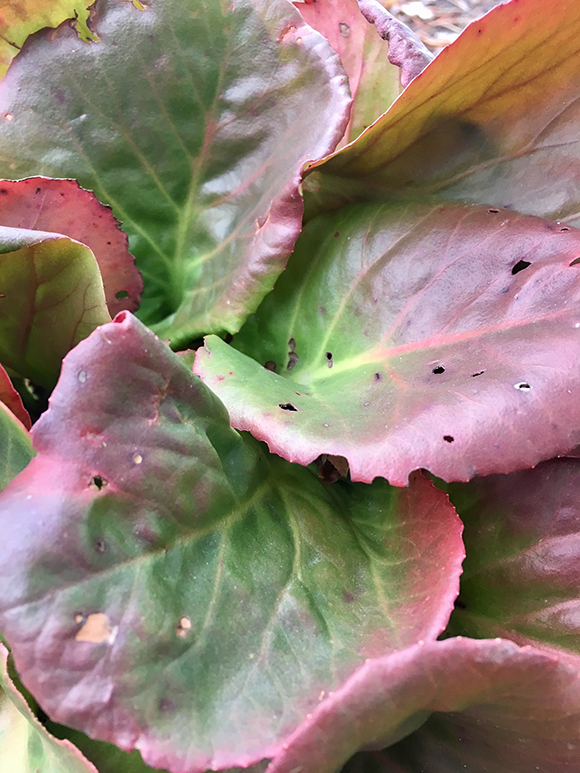 Older leaves can look shabby by spring, especially after some winter burn, but do resist the urge to cut them off in your garden until this transfer of reserves is complete. Prematurely removing evergreen leaves can weaken the plant and cause them to flower less. Bergenias have 1-foot-tall, leathery, paddle-shaped leaves that turn a mahogany color in the fall and winter. In early spring, clusters of pink flowers are held on thick stems. Blooms are sometimes seen during cooler weather in autumn. Plant bergenias in a partly sunny spot that is moist, but not wet. The common name, pigsqueak, comes from the sound that is made when rubbing a leaf between your fingers. 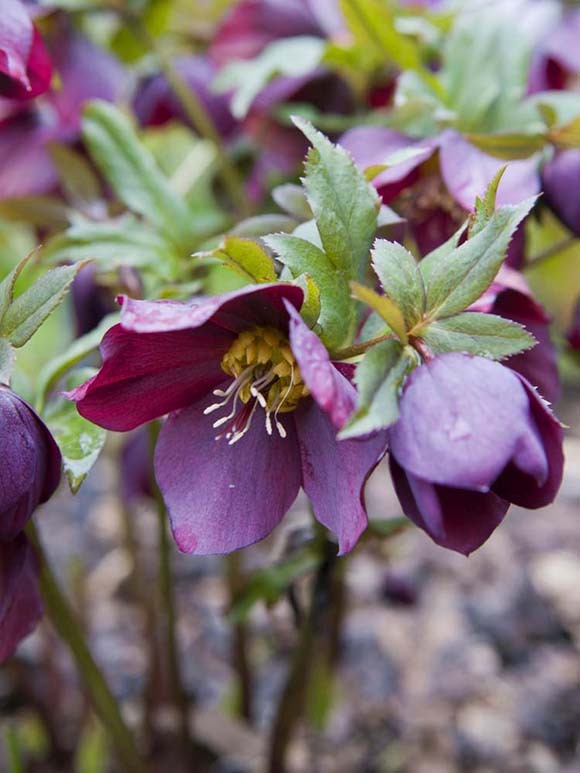 Before the snow has even melted, you will find hellebores in flower. The common name, lenten rose, refers to the ability of this plant to bloom at the beginning of Lent. Green, white, and maroon are the most common flower colors found, and some have attractive spots on the inside. The evergreen foliage is less than 2 feet tall, coarse and leathery, and combines well with ferns and other woodland plants. Rich soil and shaded conditions suit it best and under such situations, self-seeding may occur. 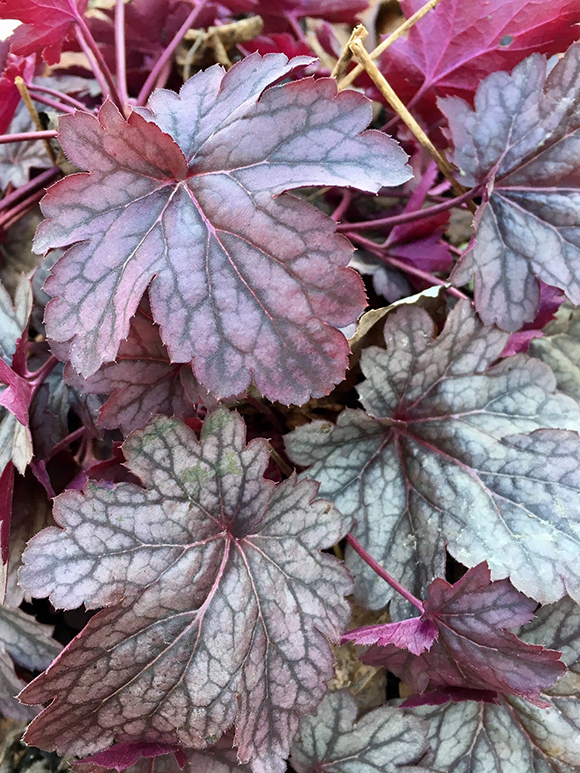 Coral bells are very popular today, and breeding efforts have led to an overwhelming amount of options to choose from. The maple-like leaves can range from burgundy to black, caramel to red, and chartreuse to silver. Flowers have gotten showier and last much longer too. 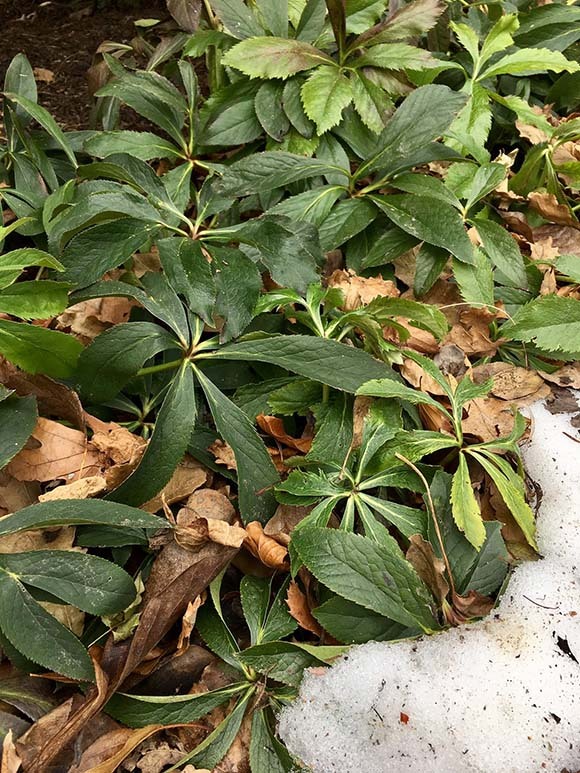 If afternoon sun is avoided, and the soil is well-drained, they are tough perennials that remain visible all winter long. Liriope spicata is green all summer—and winter—long. 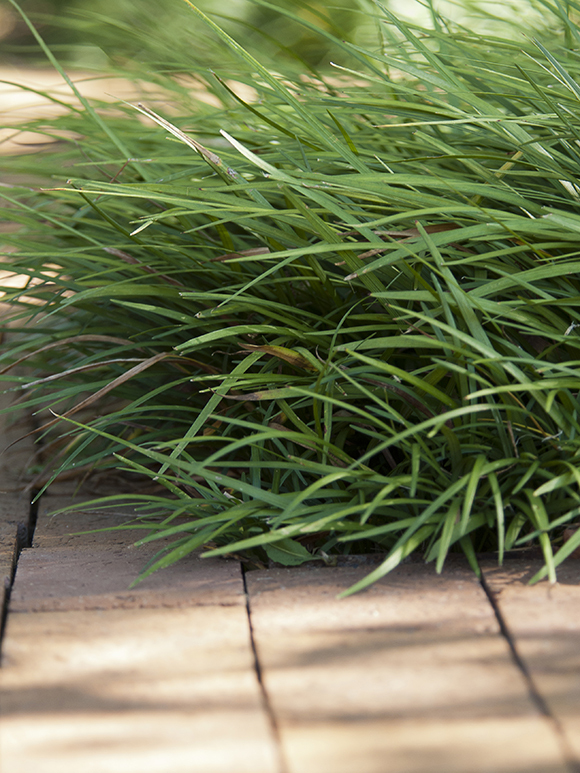 Creeping lilyturf is a tough, drought-tolerant groundcover for sun or shade. It spreads by rhizomes and makes a nice alternative to grass, provided you don’t plan to tread on it very much. It also competes well with tree roots. In autumn, the plants produce interesting spikes of violet flowers (sparingly) that lead to black, shiny fruits that look like beads. Variegated cultivars are available too. 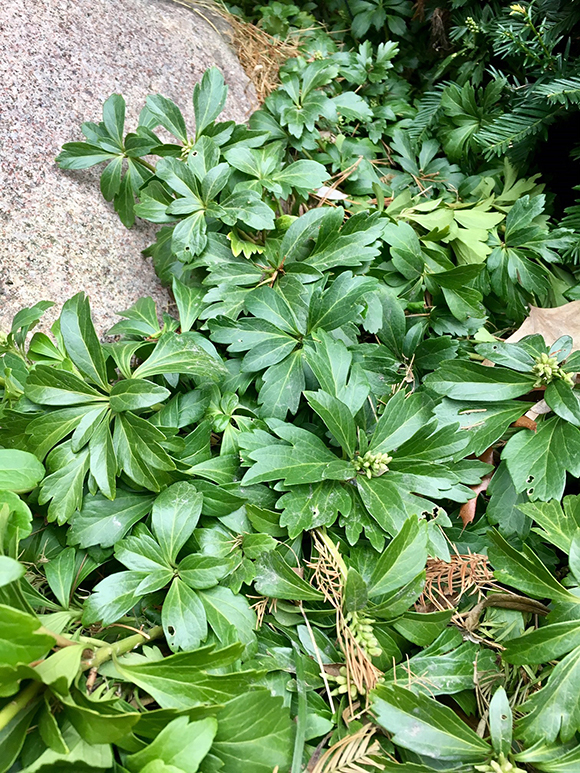 Japanese pachysandra is an extremely common groundcover for shaded landscapes. It spreads quickly and, once established, remains weed and maintenance free. 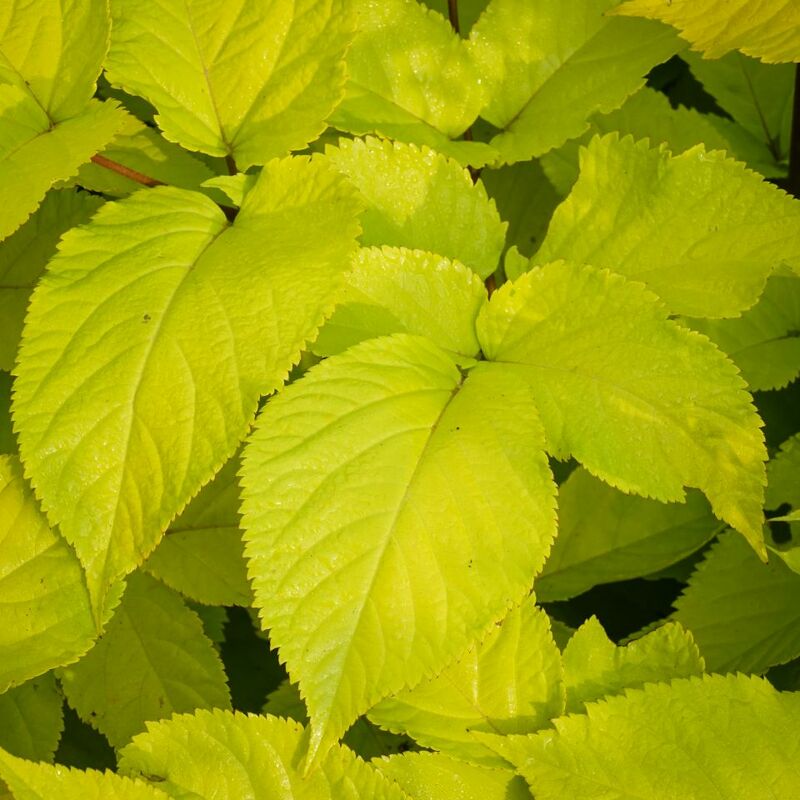 The glossy dark green foliage is attractive year round, and in spring it boasts fragrant, ivory white flowers. There is also a pachysandra that is native to the Appalachians. 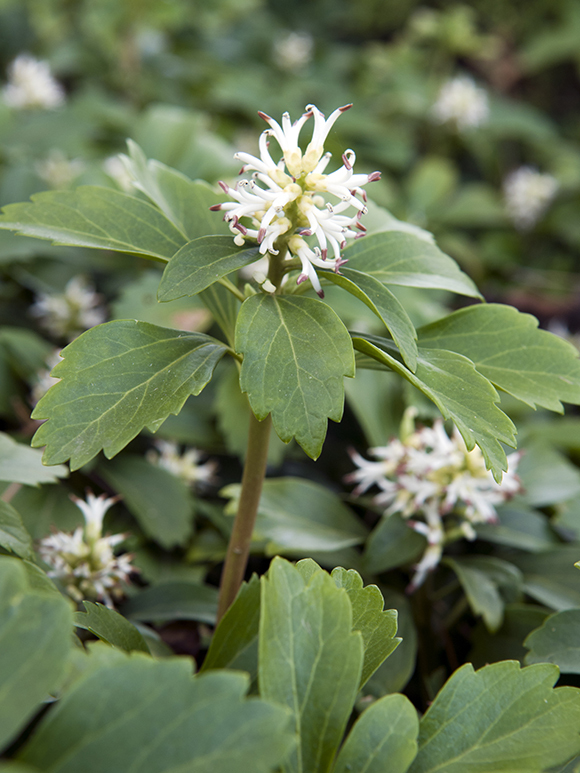 It is called Pachysandra procumbens and it too forms an evergreen groundcover, though much more slowly over time. 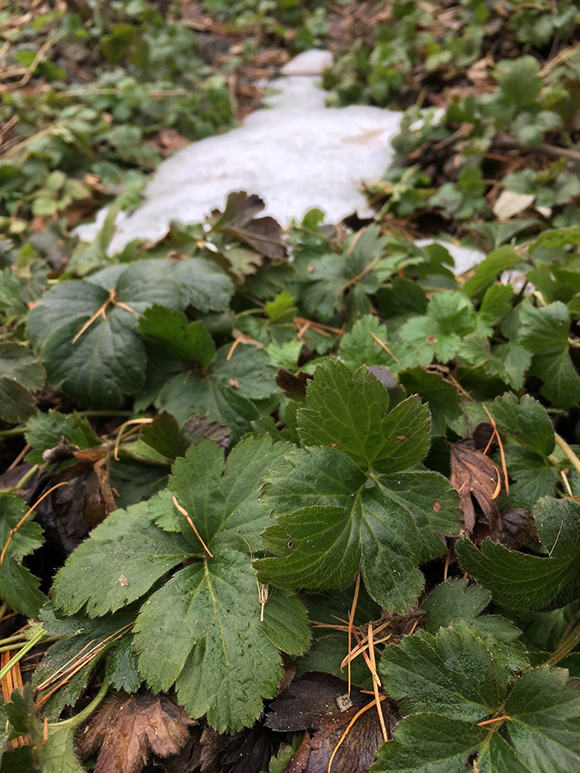 Barren strawberry is a superb, 2-inch-tall, groundcover for sun or partial shade. The plants are stoloniferous, like strawberries, and spread quickly into a weed-proof mat in well-drained soil. In mid-spring, barren strawberry is loaded with sunny yellow flowers that have five petals each. Hailing from Europe, Japan, and China but a native species, Waldstenia fragaria, has very little difference in habit or growing conditions. Native to Chicago and the eastern United States, Christmas fern is one of the few truly evergreen ferns that are effortless to grow. 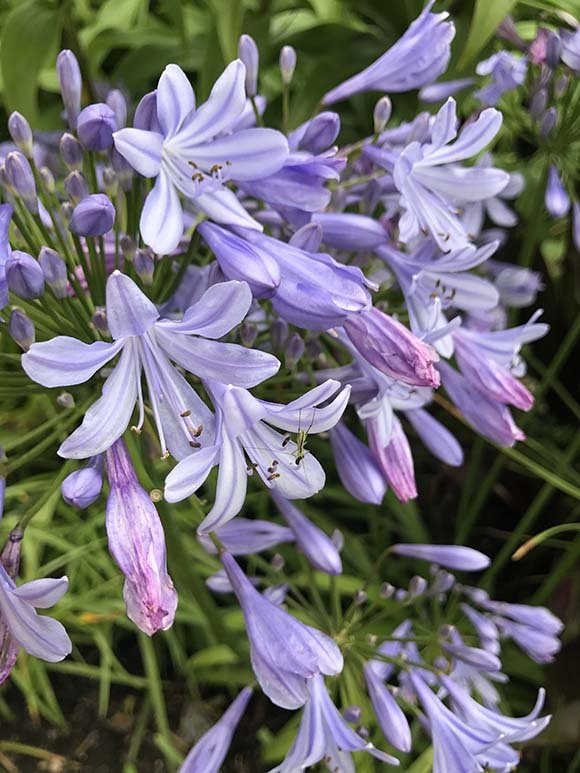 All it needs is some shade and a well-drained spot, and in a few years, you will have a sizable 2-foot-tall plant, forming a 2-foot-wide clump. In spring, cute fuzzy fiddleheads emerge out of the dark former fronds. 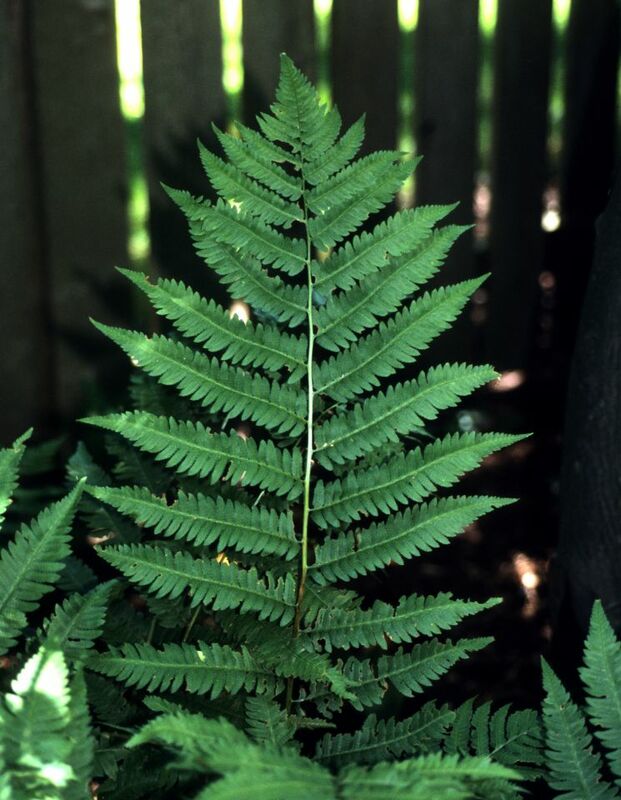 You can start your own colony of Christmas ferns by digging up mature plants and dividing them into additional ones. Barren strawberry is a superb, 2-inch-tall, groundcover for sun or partial shade. The plants are stoloniferous, like strawberries, and spread quickly into a weed-proof mat in well-drained soil. 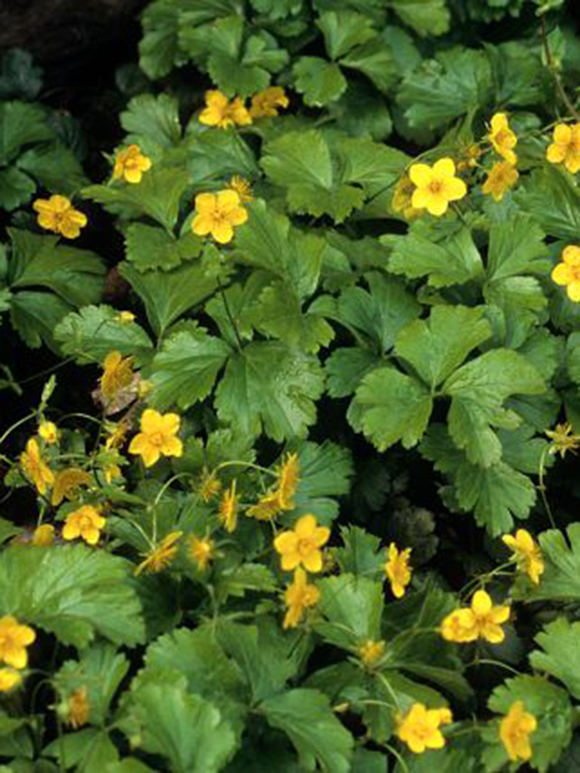 In mid-spring, barren strawberry is loaded with sunny yellow flowers that have five petals each. Waldsteinia ternata hails from Europe, Japan, and China. The common name, barren strawberry, is shared with another species, W. fragariodes. 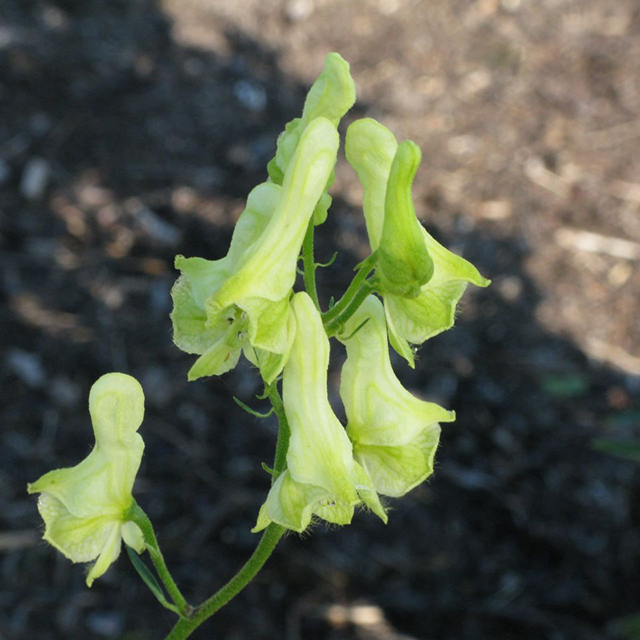 The latter is native to the United States; however, nurseries offer it much less frequently than W. ternata.